The red and blue lights are flashing. The siren is squealing. A police officer just pulled you over. No matter what you say, no matter what you do, this time you are going to jail! Once in jail what will you do about fingerprinting? Medical Questionnaires? Wearing Jail Clothes? Fasting? Overcoming Bullies? Bailing Out? 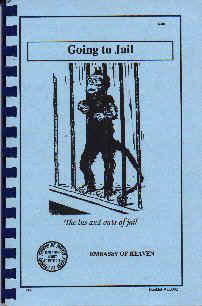 The book, Going to Jail, is a guided tour of jail. Learn what to expect. Learn your options. Take some of the fear out of GOING TO JAIL! Order your own copy today! Click here to listen to 2-hour program on Going to Jail!